BURNABY — Thomas Ford has a pretty simple eye test and the head coach of the Simon Fraser Clan trusts it more than anything else when he’s watching a potential prospect. 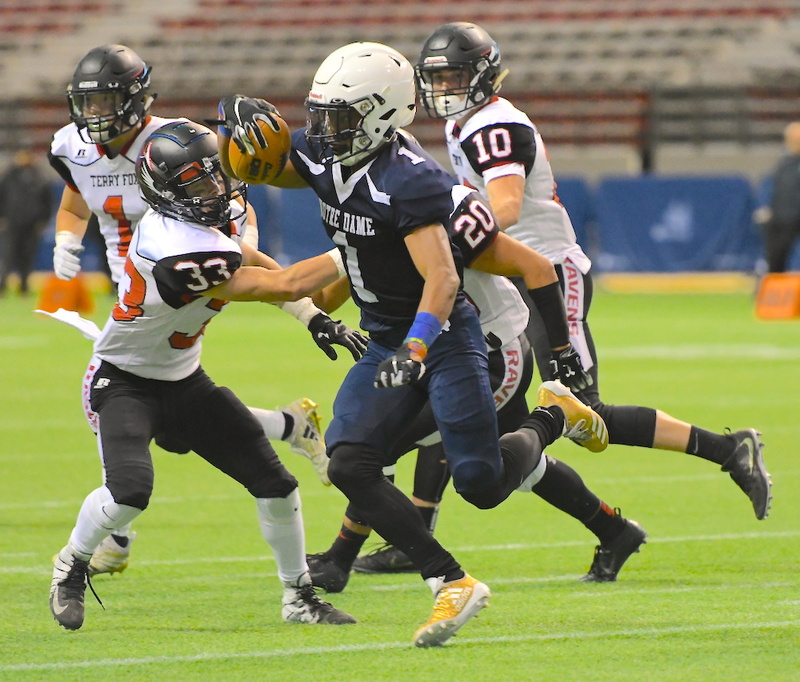 Not that being named a Subway Bowl B.C. Triple A all-star or a coveted Top 100 player nationally by Canada Football Chat is anything to ever ignore. 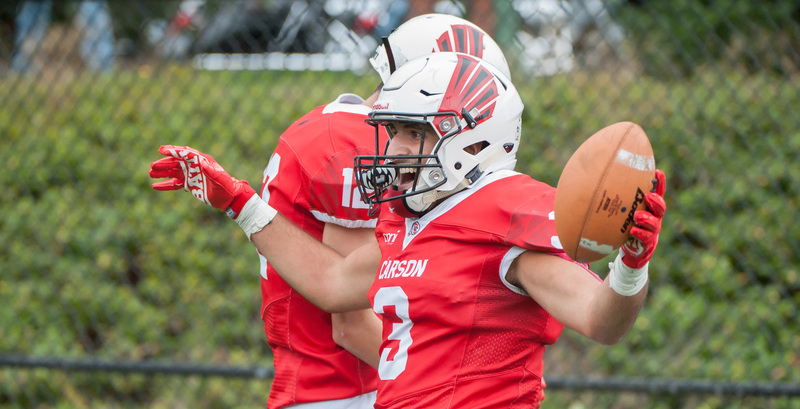 But it seems that every time Ford found himself at a high school game watching Evan Nolli, the New Westminster Hyacks versatile 6-foot-3, 250-pound two-way lineman in person, one thing kept happening over and over again. “All of those other things mattered a lot less than what we saw on the field and we watched him three or four times in person this past season,” Ford said during Wednesday’s National Letter of Intent signing day, explaining the machinations involved in scouting a player who might just top his incoming 12-man defensive recruiting class. While last season’s Clan team allowed its share of yards and points during a campaign which ended with a 1-9 record, there were so many moments in which it was able to string together the stops which gave its offence a chance to win in the fourth quarter. 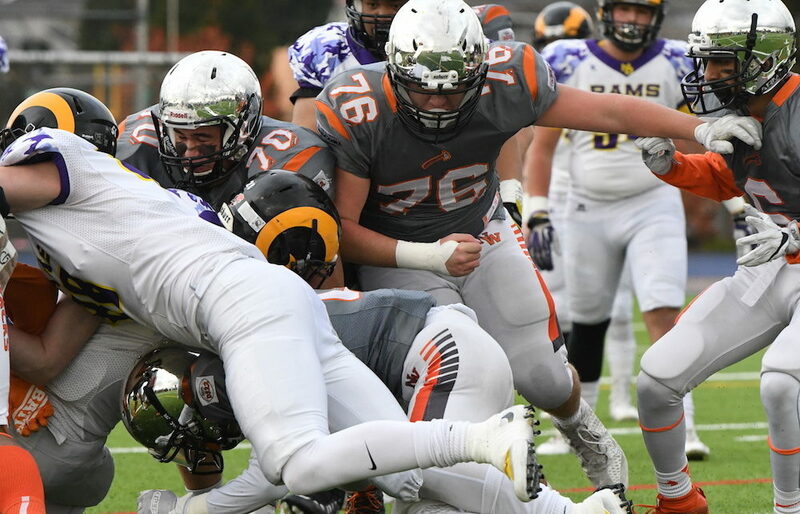 Ford is hopeful that a player like Nolli, with his versatility and athletic ability, will be able to anchor a new level of performance along the defensive line. “He’s a man of few words, really unassuming but in terms of being a playmaker on defence, I don’t know if we got a better one in this class,” Ford added. The prospect of joining a re-building program did not scare off Nolli, who has always had a way of looking at situations with a deeper, broader perspective, even when those situations were specifically impacted him. Nolli’s response to what became a request to change positions for the betterment of all? In a lot of ways, that wide-angle view of the future opened his eyes to benefits of pushing outside of his comfort zone. You could even say it helped him find his place with the Clan. Lalji said that the attentive individual nature of the Clan coaches to their recruits really resonated with Nolli. Nolli will be joined in the freshman class by a pair of other defensive linemen in Christian Butenschoen, a 6-foot-2, 270-pounder out of Bellingham High, and Brandon Kennedy, 6-foot-1, 295-pounder from Ford’s former head coach posting of Tacoma’s Stadium High via Reedley College just outside of Fresno, Cal. As is the case at several positions on the Clan roster, a relatively small group of four linebackers joins a holdover group which has as many as 11 combined rising sophomores and juniors returning. Three B.C. 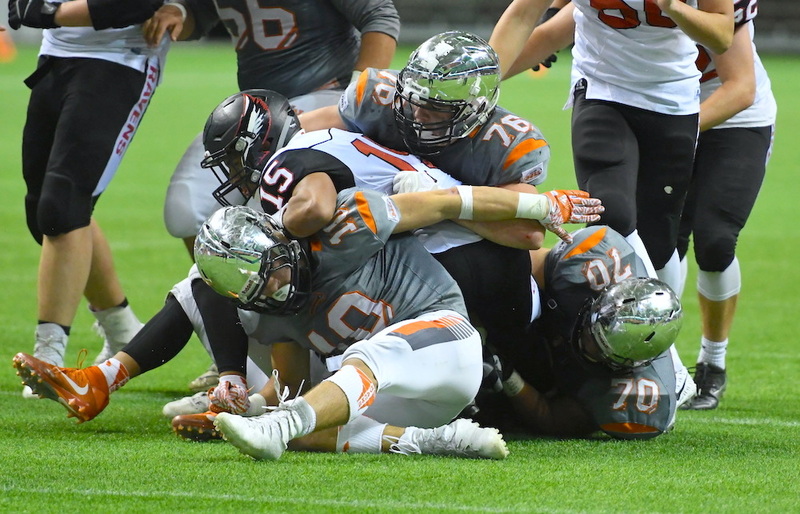 high school products, all inside linebackers are highlighted here in Abbotsford’s 6-foot-2, 220-pound Luke Szmutko, 6-foot-1, 195-pound Mahyar Hosseini of North Vancouver’s Carson Graham, and Justice Kremler, at 5-foot11, 230 pounder who returns to the Clan after spending last season with the Vancouver Islander Raiders. As far as Hosseini goes, Ford again trusted the eye test. A pair of Washington prospects come in as outside backers in 6-foot-1, 215-pound Darrion Smith from Enumclaw, and 6-foot-1, 205-pound Ian Crocker from Seattle’s Ballard High. Jerrell Cummings opened his senior season with Vancouver’s Notre Dame Secondary on the injured list, but when he returned at mid-season to line-up as both a defensive back and receiver, he was impossible to miss. Ford studied Cummings at last summer’s Team B.C. tryouts and loved not only his on-field talent, but the way in which he invested himself in the team’s overall well-being as a leader and communicator. There is a crowded field of returning talent at this positional group, one that played above the GNAC average against the pass. Cummings will be joined by Zairech Kremler, the 5-foot-11, 170 pounder from Mt. Douglas who initially projects as a safety with the versatility to go in any number of directions. 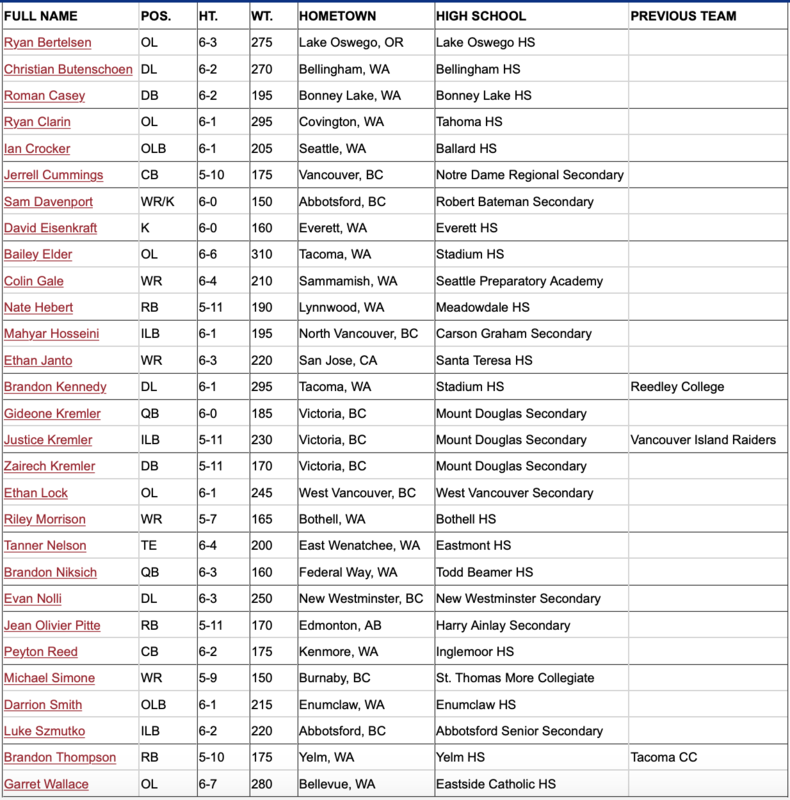 Other newcomers include Peyton Reed, a 6-foot-2, 175-pound corner from Kenmore, Wash’s Inglemoor High and Roman Casey, a 6-foot-2, 195-pounder out of Bonney Lake (Wash.) High.